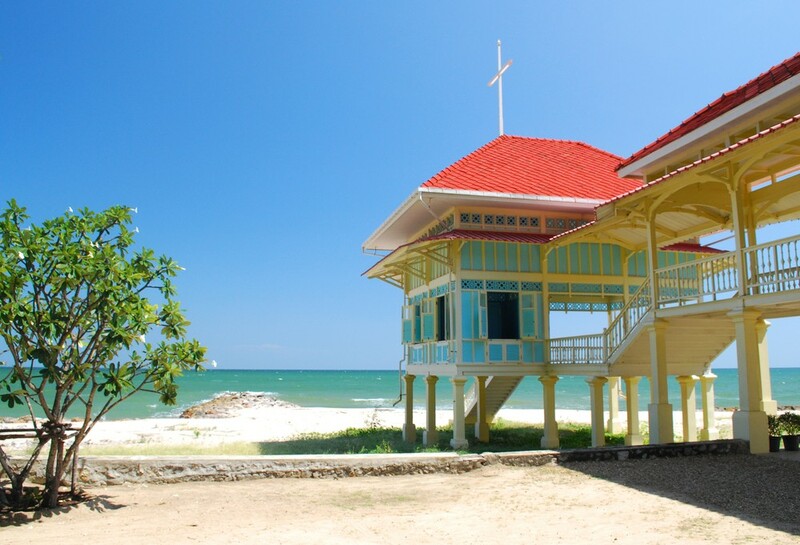 On weekdays Hua Hin leads a normal life as a relaxed laid back beach town. Come weekends, the curbs outside restaurants on the main streets are lined with thoroughbred machines, the likes of Mercedes, BMW’s and Jaguars as the villa and condo dwellers come out for their meals. After meal time, the town is back to normal again. 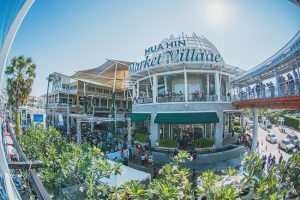 By and large, Hua Hin does not have the brassy beer bars and racy nightlife as on the other side of the Gulf. The superior beaches, wide open endless stretches of fine powdery white sand, are relatively un-crowded and clean. The pace of life is calm and relaxing, an ideal place to holiday or enjoy those blessed retirement years. Thereafter, the royalties and the cream of Bangkok society followed suit, building stately beach villas in a row down the shoreline. 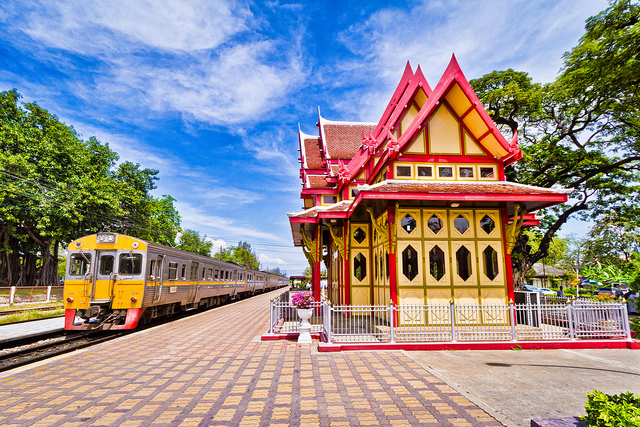 The Southern railway was extended to Hua Hin in 1922. A stately Railway Hotel was built in the style of the grand hotels of Europe, serving afternoon tea, champagne dinner, with regular garden party and ballroom dancing. 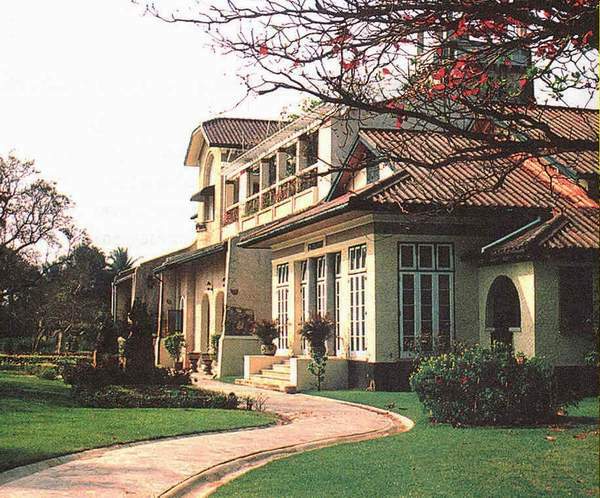 Then, the Royal State Railway Golf Course, the first and some say the most beautiful in Thailand, was built on a wooded hill estate across the track from Hua Hin Station. 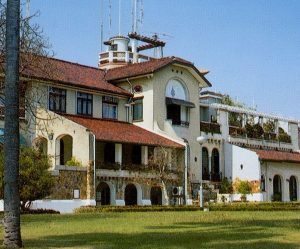 The uphill-downhill fairways lead through thickets of 100-year old trees. Glimpses of the blue sea can be seen from several tee offs. Hua Hin, with the lowest rainfall in Thailand has always attracted retirees, but since the tsunami that destroyed much of the Andaman coast in 2004, its popularity has shot up. The town now has quite an international flavor supporting various foreign language newspapers, internet forums, and delicatessens catering to the needs and wants of the Italian, German, Swedish and British ex-pat populations to name a few. 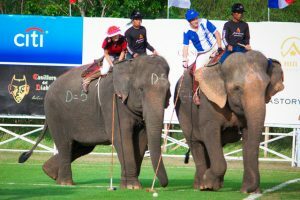 Much of the time will be spent relaxing on the beach or garden, but for those of an active disposition, the town offers a wealth of opportunities to learn a new sport, take up a hobby, or just continue an old one. All types of water sports are available, from kite boarding to kayaking, with expert tutors to help the novice. 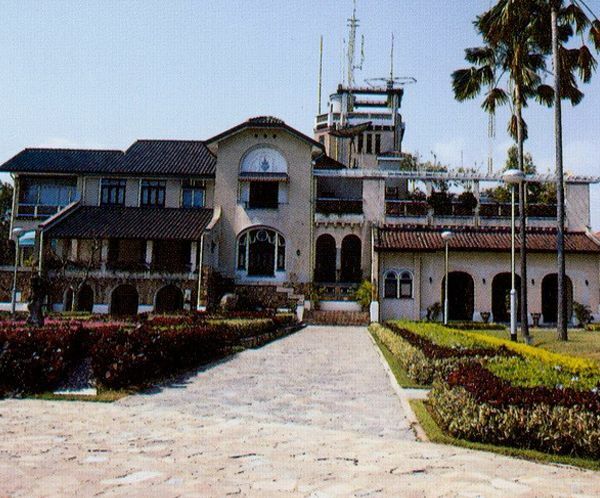 Check out the nightly Thai Boxing matches in the town center and then consider taking up the sport. 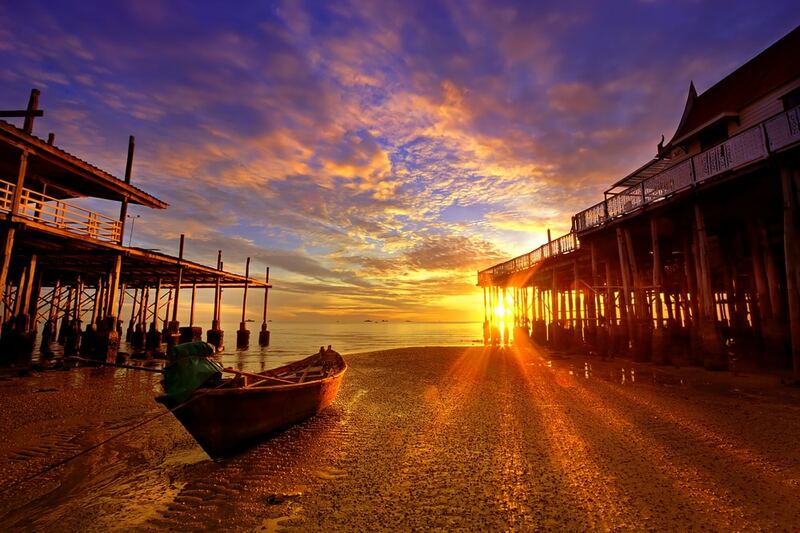 You can learn Thai, take up painting or yoga, go cycling along the coastal highway, or go on night fishing boat trips. Retirement is the ideal time to take up golf, or to improve your game. 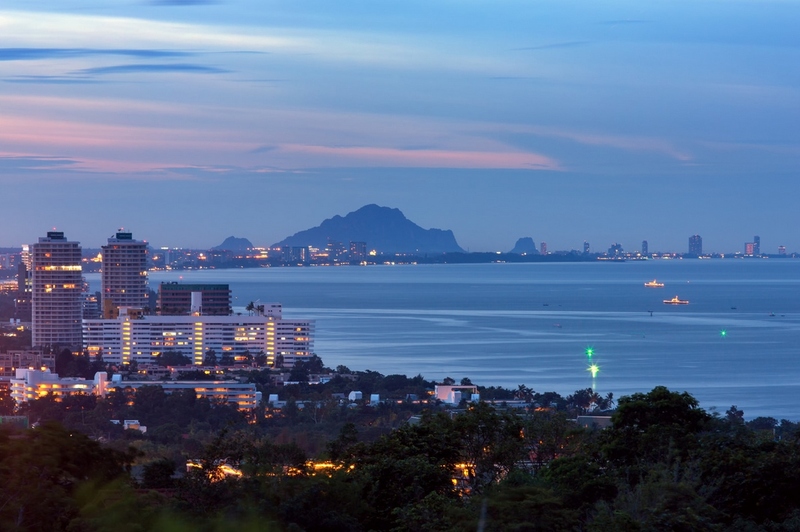 Hua Hin has eight of the country’s top golf courses and although it is difficult to quote prices in the present climate, the average prices for a round of golf for two, ranges from 2,020 Baht at the Royal Hua Hin to 3,800 Baht at Springfield, with all courses charging about 300 baht. extra for week-end play If you enjoy Thai food, you may sometimes still yearn for the tastes of home, and all you need in this respect can be had from the Hua Hin Bazaar in the centre of the town, Villa Market or Tesco/Lotus in the Market Village Shopping Mall which also includes a cinema, and bowling in addition to many restaurants and retail shops. 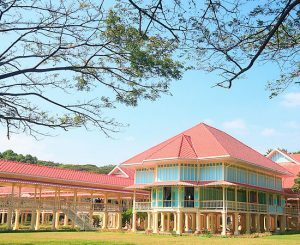 Take the modestly priced local bus to nearby places of interest (about 10 baht per journey) or book a taxi for a day for about 2,000 baht (but make sure the taxi-driver has insurance)! Many days can be spent at the seafood restaurants along Cha’am beach, at Khao Takiab, Suan Son, and at the National Parks of Kaeng Kachan and Sam Roi Yod and there are umpteen places of interest in the area, from The River Kwai to Petchaburi and the Floating Market. 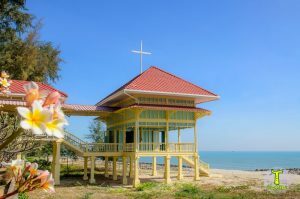 Hua Hin is the Spa capital of Thailand and prices for treatments range from 5,000 baht in the top hotels to 700 baht for equally good treatments but less luxurious surroundings in the town spas. You can, of course, have an excellent massage on the beach for about 300 baht for one hour (bring your own towel). 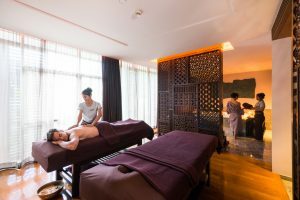 For the ultimate spa adventure visit Chiva Som in Hua Hin, consistently voted one of the ten best spas in the world. 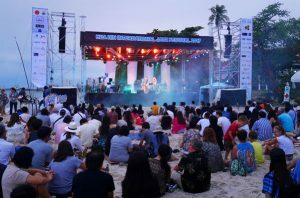 And all during the year there are festivals and events covering jazz, blues, classic cars, elephant polo, and the Thais own traditional festivals. Come Christmas and New Year the place goes crazy and it’s worth a trip to Bangkok to see the Christmas lights – they are magical. And think about your New Year’s Eve celebrations. 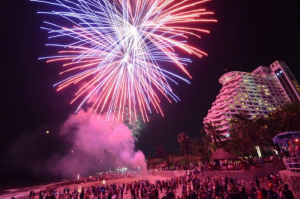 The Bangkok Post for the past four years has voted the Dusit Thani Hotel in Hua Hin to be the best place to celebrate New Year’s Eve, so check it out. 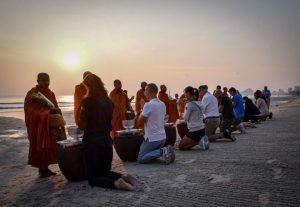 If you really want to assimilate with the locals, pop down to the vegetable market very early one morning, buy a tray of food (already prepared) and present it to the monks who will come along as dawn breaks in the quest for alms. You will gain much merit by doing this, and you will gain an added respect from your Thai neighbours.